If you follow me (or almost any other Jays fan) on Twitter, you likely know how I feel about the team’s roster moves yesterday, as my feelings are far from unique. 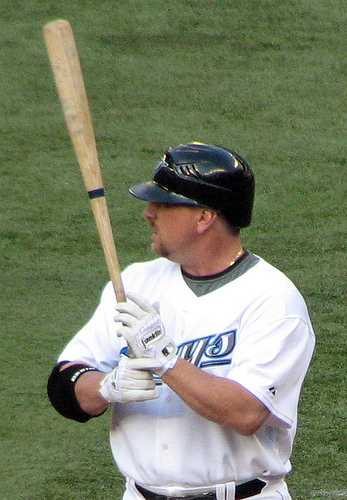 But on this day when the Jays begin the career most-highly touted Canadian prospect in probably ever, I think it’s important to talk a little bit about the guy who is, for my money, the most-entertaining Canadian player ever: Matt Stairs. As if everything above wasn’t enough, Stairs, by all accounts, is a great guy. And great guys, they don’t forget where they came from. Which makes it too bad that Baseball Canada has ruled Stairs ineligible for the upcoming Canadian Senior Baseball Championship. It’d just be too good, I guess, to let Stairs finish off the year with the team where it all started for him — the Fredericton Royals. Too good, especially since, of course, the championship is being played in his home province. Stairs being Stairs, though, he hasn’t ruled out any involvement in the tournament, saying he’s considering a coaching role. That’d be nice for all involved, but it’s too bad that the good people of Miramichi, N.B., won’t get to hear his excellent walk-up music. 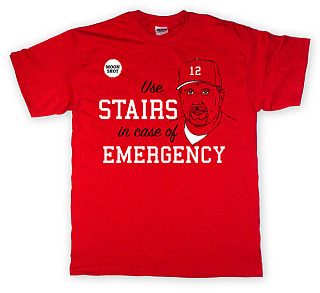 UPDATE: Chris Jaffe of The Hardball Time just alerted me to his own post on Matt Stairs. Jaffe takes a look back at the most memorable games in which Stairs has played and the list is, unsurprisingly, pretty long. Worth a read for sure. There has always been a lot of talk on Blue Jays blogs about maple boners. I don’t consider myself to be sporting one of those. I’d really like the Jays to get the best player possible for each position, regardless of where they were born. That’s not to say that I wouldn’t love to see Canada’s only MLB team chock full of Canadian players; I would. I wouldn’t like to see that because of some misguided notion that it might fill the SkyDome. No, I’d like to see it because, if it was done the right way, it would mean that Canada was producing a metric assload of talented players. The Blue Jays, like it or not, have a big part to play in the development of Canadian baseball. For the most part, it’s an indirect role they have to play — get young Canadians interested in the game. The best way to do that is to do what they’re trying to do anyway: Win. But every now and then, the Torontos go above and beyond the call of duty, even if not for altruistic purposes. The recent winter tour is a good example of that. I’m sure the team organized the trip to drum up interest in the Jays, but growing interest in the Jays also grows interest in the game. If a few more kids pick up ball gloves this summer because of that tour, the state of the game in Canada will be better on the whole. Today, the Jays are taking on the Canadian Junior National Team in St. Petersburg, Florida. It’s a game that ultimately means nothing — the Jays are only dressing two players who will definitely play in the majors this year (Aaron Hill and John McDonald) — but a game like this should go a long way toward inspiring the kids on the national junior team to put in that little bit of extra work that’s needed to reach the next level. Looking into the opponent’s dugout and seeing junior team alumni (Brett Lawrie, Adam Loewen, Marcus Knecht and Michael Crouse) won’t hurt that cause, either. I have, for a few years now, referred to Shaun Marcum as The Future. I just realized that somehow never made it into this blog until now. About 30 minutes ago, I got a text that said simply “The future is over” and I knew immediately what it meant. I’m going to miss Marcum’s dirty hat and wicked changeup. It should be fun to see him tear through the National League (and he will be great in Quadruple-A) but I’d much rather him make hitters looks foolish while he’s sporting the Jays uniform. But things change, the Torontos still have a great group of pitchers and I have faith in The Plan, so I’m not going to freak out about losing a guy I can honestly say was my favourite Blue Jay. Fangraphs had him listed as the No. 2 prospect in the Brewers system last year. He was on the roster for Team Canada at the 2009 World Baseball Classic as a 19-year-old. He got into one game as a catcher, but didn’t get any at bats. His aunt won a bronze medal in curling at the 2002 Winter Olympics. His sister Danielle can throw a softball like nobody’s business. That don’t tell us much to be sure, but maybe those good curling genes will come in handy at some point. Canada’s team in the capital? If the Blue Jays really want to be Canada’s team, ownership should sieze upon at least one (or preferably both) of the ideas floated today. First, the idea of playing a series in Montreal resurfaced over at The Tao of Stieb. Every time this idea comes up, I get excited about it. Montreal is an astounding city. Any excuse to go there is a good one. A trip to see the Jays there? That would just be too good. The second thing that came up is, if you can believe it, more exciting than the thought of a road trip to watch the Jays play in Montreal. Rick Chiarelli, an Ottawa city councillor, went on record with the Ottawa Citizen to say that he’s “optimistic” about bringing baseball back to Ottawa. 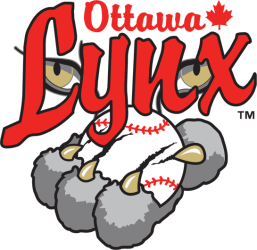 A return of the Lynx would be great for baseball in this country, but Chiarelli went even further — he’s “been talking with Toronto Blue Jays officials” and that team officials have toured the stadium and were “impressed” with it. Now Ottawa may not be as fun a destination as Montreal — it’s not even close, really — but the option of heading up to Ottawa to watch a Jays farm team pretty much whenever I want is one I’d choose over having one weekend of baseball in Montreal 10 times out of 10. One hitch though is that any new team would need investors. The Citizen points out that “Ottawa participants do not need to be majority owners,” but maybe Eugene Melnyk heard the noise Daryl Katz made a while back and is feeling competitive? That’s probably unlikely, but it would be pretty fun to have two of Canada’s richest dudes getting involved in baseball, even if it would be at the minor league level. The Edmonton Sun is reporting that Edmonton Oilers owner Daryl Katz wants to buy a PCL team and move it to the Alberta capital. The team he’s reportedly targeting? Toronto’s Triple-A affiliate, the Las Vegas 51s. By all accounts, Edmonton’s previous Triple-A team, the Trappers, were a success. Both on the field and in the stands — moving only for political and geographic reasons. Personally, I hope Katz is able to pull this off. It’d do wonders for baseball in Canada and specifically for the Jays. Toronto likes to market itself as a Canadian team and this would go a long way toward proving that they are in fact Canada’s team. Hosting a series in Vancouver and/or Montreal would help as well, but I digress. I know Toronto’s contract with Las Vegas expires after this season, but if the 51s move to Canada, the affiliation’s got to continue. Geographically, it’s not great, but it’d be too much of a marketing opportunity for someone like the Beest to pass up. Kyle Drabek, the key to the Roy Halladay deal, threw a no-hitter the other night for the New Hampshire Fisher Cats. Here, via Go Jays Go, is video of the final out. Something strange happened between the final days of spring training and last night’s game in Kansas City. 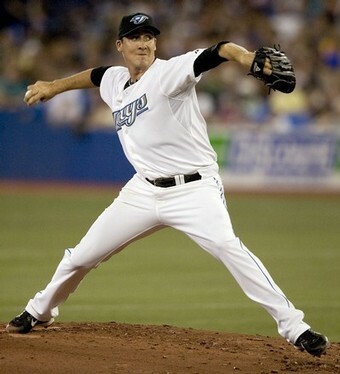 At the end of March, Vancouver’s Scott Richmond was fighting for fifth spot in the starting rotation and seemingly won it solely because neither Brad Mills or Brett Cecil were quite ready to head to The Show. With last night’s performance (7 IP, 1 ER, 5 hits, 5 Ks) Richmond seems to have removed any doubt that he belongs. In fact, he’s performed so well this season that at one point during the game, Jerry Howarth and Alan Ashby were joking about giving Captain Canada the Doc treatment and keeping him on four days’ rest even if an off day gets in the way. They may have been joking, but I think it’s a good plan. With Ricky Romero and Jesse Litsch on the DL, David Purcey seemingly unable to hit the side of a barn and Brian Burres being, well, Brian Burres, maximizing the number of starts from the two best pitchers doesn’t seem like a bad idea to me at all. The other guy filling out the rotation right now is, of course, Brian Tallet. He’s been pretty impressive as a starter so far this season, and if he can keep it up, I’d keep him in there even when Litsch and Romero get back. Obviously the first starter to go when people get healthy is Burres. Pre-season logic would dictate that the next move would be to send Tallet back to the bullpen but, assuming nothing drastic happens between now and the arms getting healthy, I’d keep Tallet in the rotation and send Purcey down to Las Vegas. I’d aslo put Richmond ahead of Litsch, giving the Jays a solid-looking rotation of Doc/Romero/Richmond/Litsch/Tallet. If you had told me last year that would be the rotation, I’d call you an imbecile and/or a liar. Right now, that looks like playoffs to me. As president of the Shaun Marcum Fan Club, I couldn’t help but excited reading the great theory posted over at Ghostrunner on First. While some members of the media seem all too happy to blame manager Ernie Whitt’s pitching rotation for Canada’s early exit from the WBC, it should be noted that Whitt basically used the best plan that was available to him. With people like Erik Bedard, Ryan Dempster, Rich Harden and Jeff Francis unable (or, in Dempster’s case, unwilling) to participate and fireballer Phillipe Aumont being limited by the Mariners to one-inning stints, Whitt didn’t have much to work with. Given the circumstances, it makes sense to hold back your best pitchers for the more important elimination games. Thus we end up with Scott Richmond not throwing a pitch in the tournament. But you can’t blame Whitt for Richmond’s lack of playing time. With the mashing potential in Canada’s lineup, there’s no way we should have lost to the Italians. But our bats failed and we did lose. The only slight criticism I can offer of Whitt in terms of managing the pitchers is that maybe he should have had Vince Perkins start against the States and let Mike Johnson pitch against Italy. I’m definitely offering this with the benefit of hindsight, Johnson seems like a much better pitcher than Perkins and, following the logic that had Richmond penned in to start against the Venezuelans, Johnson should have started the elimination game against Italy. I am curious now though to see how all of this affects Richmond’s chances at cracking the Jays’ rotation. Taking time off from trying a spot to pitch for your country — and then not pitching — is not likely to be something that J.P. is going to think too highly of, especially considering his very pro-club stance in the club vs. country debate. Baseball returns to our television sets tomorrow, and the matchup — for an early pre-season contest anyway — is one I couldn’t be looking forward to more. Your Toronto Blue Jays playing host to Team Canada. And starting for Canada? Scott Richmond. If you’re a pitching with a shot at making your team’s starting rotation, what better case can you make for yourself than shutting down the team you’re trying to make?